This poster is for an exhibition of photographs by German photographer, painter and film artist Elfriede Stegemeyer, 1908-88. 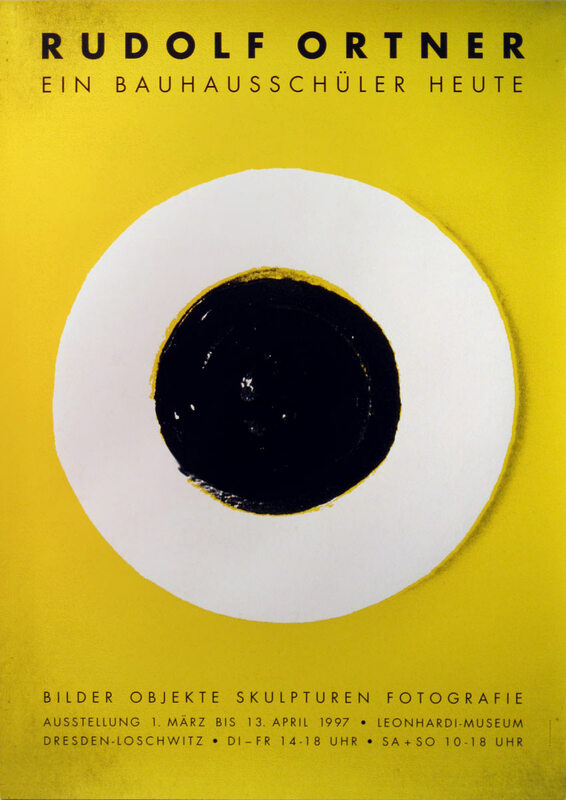 Though never a Bauhaus student, her work reflects the experimental approach to photography championed there by Laszlo Moholy-Nagy and Herbert Bayer. Tragically, most of her work was destroyed in an Allied bombing raid in 1943, and after the war she turned to painting and drawing, working under the name Elde Steeg. 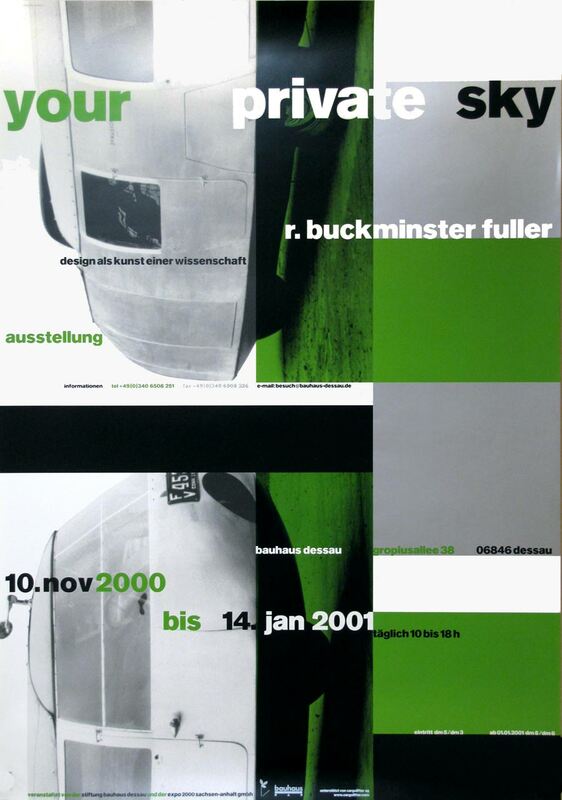 The poster publicizes an exhibition at the Bauhaus Dessau in 1999. There is no designer credit. It has a symmetrical layout which, strictly speaking, is at odds with the principals of asymmetrical layout dictated by The New Typography style which the poster reflects. Rudolf Ortner (1912-97) was a celebrated artist and architect who trained at the Bauhaus in its final years, 1932-33 in both Dessau and Berlin. He later studied painting at the former Bauhaus in Weimar thus linking his career to all three incarnations of the school. As indicated by this 1997 exhibition poster for the Leonhardi Museum in Dresden, he was an exponent of Art Concret (Konrete Kunst). 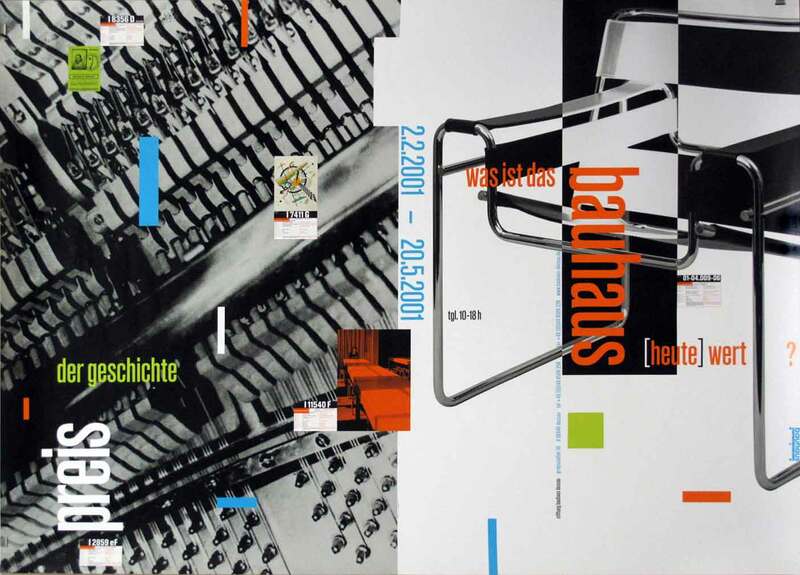 The design partnership Ott+Stein made several posters for the Bauhaus-Archiv in Berlin, starting in the 1980s; this one is from 1986. The geometric shapes are based on the roof formation at the Bauhaus-Archiv which was co-designed by Walter Gropius, founder of the original Bauhaus. Buckminster Fuller was the legendary American designer, inventor of the Geodesic dome and the Dymaxion car (pictured in the poster). He even has a molecule named after him: Buckminsterfullerene, after its geodesic forms that have applications in nano technology. 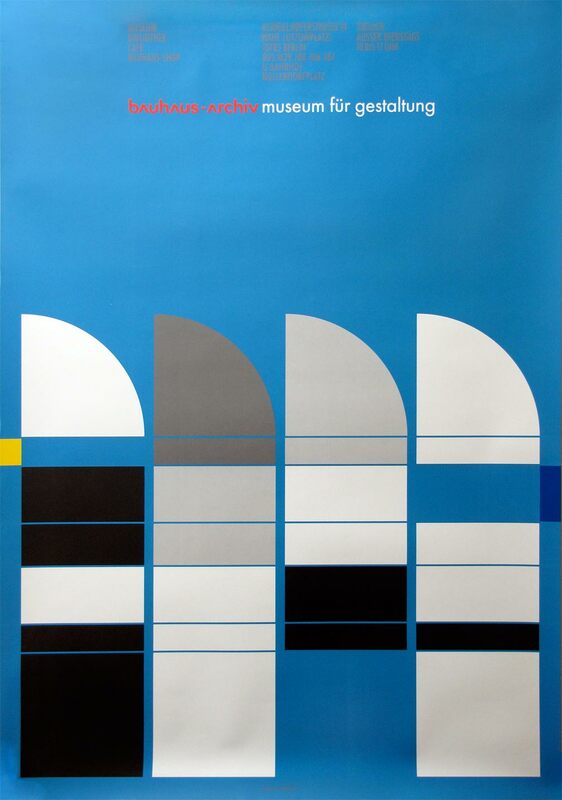 This is another poster in the Deconstructivist style by the German design studio Cyan. The client was Bauhaus Dessau in 2001. 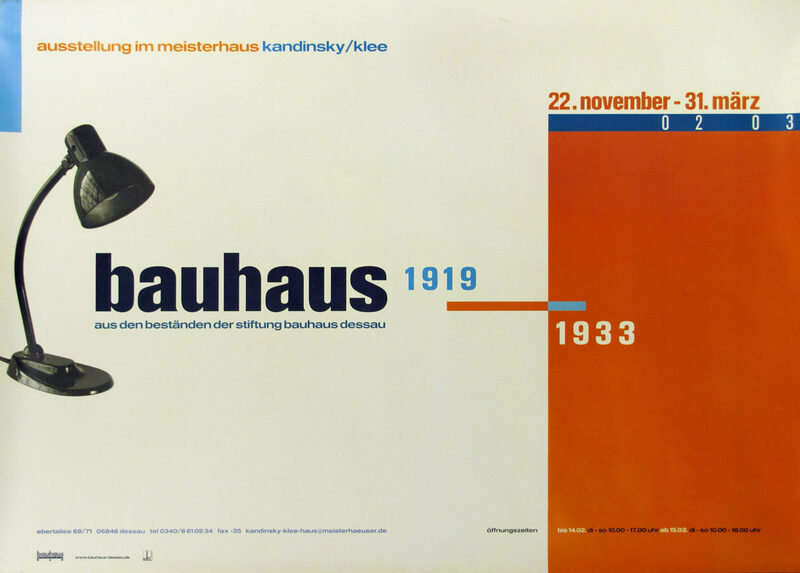 This poster was designed seventy years after the Bauhaus closed yet it shows the Bauhaus principals of graphic layout: asymmetry, grid layout, contrast of type size and colour. There is no designer credit. The exhibition was held in the Masters House shared by Kandinsky and Klee. 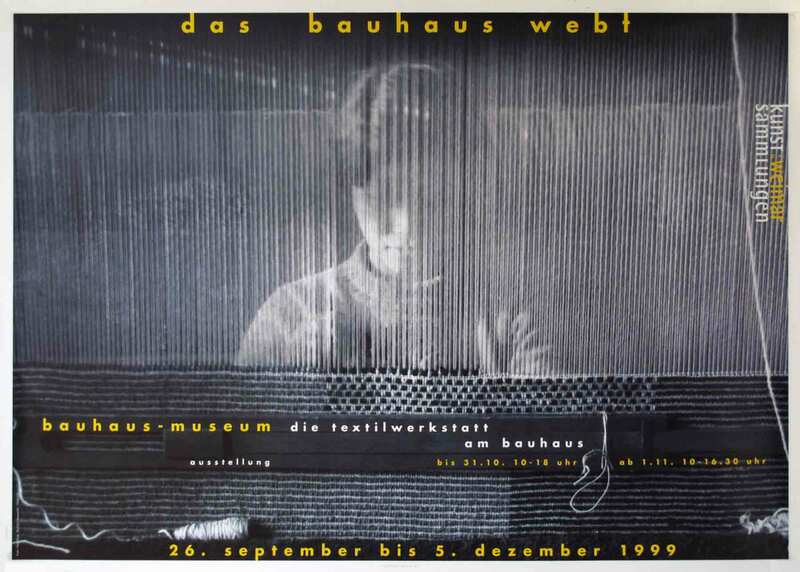 A photograph of a young Bauhaus textile student, shot through the loom; the flatness of the subject-matter matches the 2D poster itself. Note the extreme contrast between the scale of the photograph and the tiny lettering and note how the yellow lettering stands out from the blue-grey photograph. 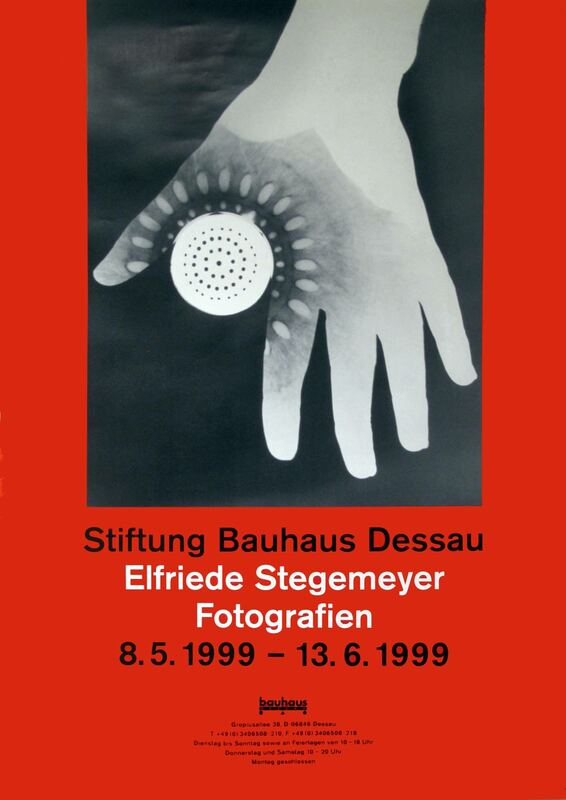 The poster was for an exhibition in 1999 at the Bauhaus museum in Weimar.